Amanda travels to the southwest to investigate a new WA agricultural company with the potential to inject new energy into the shrinking communities and tired earth of the wheatbelt . In the last days of February, I spent a few days in Williams, a small town of some 400 souls two hours south-east of Perth. The town was alive with roses. They bloomed down the centre of the street, adorned the council building and grew in profusion at the back of shops – someone in Williams has a serious thing for roses. Wide Open Agriculture, the company I had come to investigate kindly let me camp in their office, an old shop and dwelling on the main drag. I had heard about Wide Open Ag via a mob called Commonland – a landscape restoration investment fund based in Holland whose core business is sourcing finance for new agricultural initiatives around the globe. Commonland has persuasive and clear principles based on 4 Returns, 3 zones and 20 year investments. The four returns begin with inspiration: the return of hope as people work to develop land-based businesses in their community. This strengthens social capital as jobs are created and natural capital returns soil fertility that encourages the return of biodiversity and healthy ecosystems. The fourth return is financial– first there is investment with the aim to bring in the money to make projects sustainable. WOA have two projects up and running, the first a shadehouse set on a paddock that is part of a broadacre farm 45 minutes away near Arthur River where vegetables will be grown for the local and Asian markets. Food for Reason was initially conceived as a logo with the letter ‘4’ instead of the word ‘for’ as in f.o.r., to echo the Commonland principle of the 4 returns. They were to be printed on neat little carry out tomato produce boxes until someone unearthed the fact that 4 is to the Chinese as 13 is to us, a very unlucky number. Global sensitivities must be noted. The other project operates on broadacre land at Buntine, near Dalwallinu in the Midwest. Called Land for Reasons Pty Ltd (LFR), this is a 100% WOA-owned subsidiary that purchases agricultural land through innovative and flexible financing mechanisms. But more on this later - this project deserves a podcast all to itself. For Commonland to be partnering with WOA is an indication that the levels of local involvement, expertise and preparedness for driving change in the agricultural sector in this area are high. The council that advises and supports WOA is a role call of WA’s most innovative and forward thinking farmers: those who have stepped off the treadmill of conventional farming and using observation and experimentation are restoring fertility and biodiversity on their farms. 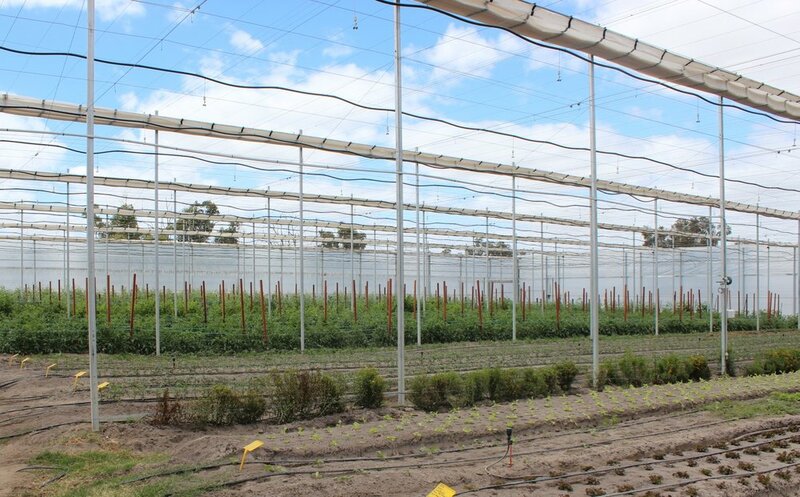 WOA have recently launched on the Australian Stock Market, raising $5million to sink into the community and to grow the vertically integrated food-growing and land business model they have developed across the wheatbelt. When you think as big as WOA it takes a while to get the extent of the vision. Visiting the shadehouse – known as the Wedge –connecting with the 8 dedicated and enthusiastic souls who make up the WOA team – and trying to get my head around the size of their vision was a challenge. Not least because I started to give serious thought to the word organic. What the hell is organic anyway? In a conversation with Dr Ben Cole, managing Director of this outfit, I learn that organic produce gets a premium in the marketplace, currently 60-80% of organic produce comes in from east or overseas, and demand outstrips supply. Overall, the term organic is used to indicate that product is grown without the addition of industrial chemical – but as Damien, the first head planter at the Wedge pointed out: ‘being organic is more than inputs’. And as we, the switched-on consumer knows, organic is one of those terms that has been severely compromised by being liberally plastered on everything from lollies to dishwashing liquid. It is possible to grow organically (possibly not to be certified as organic) by pumping the plant with animal-based natural nitrates, nutrients and water and still not maintain natural cycles or achieve the nutritionally dense fruit and vegies that you would get if they were grown in fully biologically functioning soil. This might explain some of the less-than-satisfactory organic moments I have had. I have been stung by paying a lot for something – carrots spring to mind - that do not have the flavour and well…carrotness that I crave. The term organic is still stuck in the 70’s – and nothing wrong with the 70’s – but the old lentils and brown rice paradigm just doesn’t cut it in today’s foody culture. Organic food is still synonymous with that depressing notion that it is good-for-you (groan). Dan Barber, the New York chef who wrote The Third Plate (currently one of my bibles) points out is that ‘organic in its fullest sense is synonymous with what is delicious– if the produce tastes wonderful, then you can be sure it comes from a healthy, bio diverse, fully functional ecosystem’. On this subject, in the USA, a bunch of small scale independent organic farmers are currently redefining what ‘organic’ means in a new label called ROP or Real Organic Produce. These farmers have long been upset with the NOP National Organic Program over its decision to allow hydroponic produce into the coveted organic certification. The ROP mob insist that soil is a vital component of ‘organic’, the final straw was the NOP’s weak stance on basic animal welfare as a principle of ‘organic’ certification. The ROP are now faced with the huge task of developing a new label that reflects their principles of transparency and integrity, to sit on top of the certification from the National Organic Program. Part of their push is a customer education program called JUST ASK. Real Organic Produce farmers are convinced that if consumers of organic fare knew the choice was between soil-grown produce from small independent growers or the produce from gigantic hydroponic operations, they would win hands down at the checkout. I arrived on site with Mez, the marketing and sales woman and Kel the People, Culture and Systems manager, both making a foray from Perth for a regular catch-up with the growing team. In a shed next to the shadehouse, workers Drew and Julius, were busily packing the weekly vegie boxes. Sixty souls, mostly local, with some in Perth were to receive boxes brimming with tomatoes, eggplants, lettuce, zucchini, cucumbers, pumpkin and rockmelon. The wedge is a protected space. 5000 square metres with three watering systems, drip lines, standing sprinklers and misters handing from the structure. Plants are dug directly into the soil and the roof can be set to open and close automatically by temperature and humidity triggers. And all set within a larger design on the .5 hectare site. The Wedge has 6 bays and is marketing its product as ‘single source’ – it was important for this mob to start with their intentions clear, and this was to make boxes of vegies available for the locals. Admirable aim, and a tough gig for the grower who has the unenviable task of pulling it off under a single roof. Tomatoes thrive with heat and humidity. Lettuces handle heat with moisture but hate humidity. Seedlings require a different watering regime to full grown plants and it all needs to be done with rotations and a mind to compatible planting. Between the rows, healthy stands of edible weeds, herbs and other plants add to the sense of abundance and biodiversity – meanwhile – my particular nemesis, couch grass, is making its presence known and the team sat down under a tree over lunch to wrestle with this and other problems. The application of poison will restrict the growing time as the soil must then be rested and allowed to return to biological complexity so that organic status can be gained and the bigger bucks achieved. I speculated that now might be the time to fulfil the broader social capital promise of the brief by bringing in a load of horticulturally-minded villagers and a load of forks. We’ll leave that sticky one with Kel the People, Culture and Systems Manager. Bringing in animals to do their bit for the weeds and the soil – something my 70’s heart holds as part of the term ‘organic’ – is problematic. Health regulations demand that produce cannot be sold for 90-120 days after animals have been on the same soil and protected systems, even more than outdoor growing systems, have to be on guard for the spread of disease. But this lot are quick on their feet. As the seasons rolled on from the December 2015 establishment of the shadehouse, the growing team adjusted their plantings to suit the particular qualities of the soil and rain and the strengths and weaknesses of their protected system. With the onset of cooler weather they established a sizeable outside plot and had great success with a crop of garlic. Kerry has been the project manager from the shadehouse’s first inception, chief logistics person involved in bringing energy and water to the site and is soon to be head grower. When I arrived she was deep into the logistics of water, a subject that is an ongoing concern for the Wedge. She was involved in bringing in excess water from a dam some distance from the site; running it through a newly dug concrete lined well and into the biological fertiliser tanks for use on the plants. The water was muddy and would clog the irrigation lines so she had a few buckets lined up and was working out how much aluminium sulphate needed to be added to flocculate – and by this I mean create the conditions so particles bind together and sink to the bottom leaving relatively clear water. Kerry managed the installation of the shadehouse (tradenamed Cravo, manufactured in Canada), and calculating the energy and water requirements from scratch, she was also instrumental in setting up the systems in the packing shed and worked closely for months with Damien, the first head grower, to get it all cranking….The responsibility and practical knowhow this young woman exhibits is inspiring. I got the chance to see the WOA ethos at work the day after my foray to the Wedge at a conference held by the Regenerative Farmers Network in Williams. Dr Ben Cole took to the floor with young local farming couple Steven and Kelly Ford who are in the process of transitioning from conventional to biological broadacre farming. The Fords’ story was not so much about the mechanics of this transition, but the human stuff, their struggle to change direction and go against the tide both within their extended farming family and community. Listening between the lines, I understood that Kelly laid the foundation for the bigger changes on their land through her interest in implementing healthy practises within the household. Steve acknowledged Ben as someone who simply listened, encouraged and connected him to like-minded folk. This was enough. There was honesty in the exchanges between the three as Stephen got over his stage fright and talked of how he learned to (and I quote) ‘let go of being right’ so change could be negotiated on the family farm and he could still feel comfortable going into town and playing with and coaching his beloved footy teams. Steven and Kelly started a group called Bugs and Biology with other like-minded souls and started to experiment with their cropping and grazing methods. The day was headlined by Charles Massy the writer of ‘Call of the Reed Warbler’. This book is getting huge traction around farmers’ networks in Australia and the buzz on the day was that Alannah McTernan, our newish Minister of Agriculture, read the book in 3 days (no mean feat, it’s a tome) and had recently met with the author. One of the growers in the audience asked a question: how do I transition away from the use of glysophates and other chemicals…with the unstated implication… while not going broke? This, I thought, is the burning question, where we enter the danger zone of paradigm shift. In the bigger picture, this is exactly where WOA see their role, as partnering with growers and farmers to help them make this shift by providing access to innovative and flexible finance and providing distribution and marketing options for their produce. Di Haggerty, a farmer from Wyalkatchem, and one of the forerunners in the world of regenerative farming, was one who tackled the question about transitioning from industrial chemicals. Di and her husband Ian’s decades long experimentations on their property means that they no longer use heavy pesticides or fungicides. ‘But things don’t always have to be cut and dried,’ she explained. In one cropping paddock, they had a problem with a weed and decided to apply a mild herbicide. The information that amazed me was that when they subsequently tested the grain, no trace of the herbicide was found in the seed. By supporting the soil, you are supporting the plants’ immune system. Soil, if given the chance to develop a full range of bacteria and other goodies, can support the plant’s root system (or, let’s use the more cosmic term, its rhizosphere) to not take up toxins. As Charles Massy stated in his presentation, plants and soil have co-evolved over 300 million years: to apply the bigger picture to the question I was holding about what ‘organic’ is … whether in a paddock or shadehouse, it makes sense to align your growing regimes with natural systems. It was an added bonus and in keeping with the WOA glocal thinking that lunch was supplied by local caterers using food grown in the Wedge. Ben Cole studied zoology and chemistry and took on work that led him to managing social programs to do with water quality and public health in Australia and around the world. He began working with UNICEF and became motivated by the fact that 2 billion people worldwide live without toilets. He saw how traditional donor programs – what could be called the plonk toilet approach - were not working to deliver people better health outcomes and started to research exactly what was required to make lasting change by working with the people within communities. He started investigating market-based approaches to sanitation and community change via such thinkers as Noel Pearson. Finally, he came home, bringing his work experience back to the wheat belt and the family farm near Narrogin. The working model Ben and his team are developing will be replicated when more finance is available and more shadehouses, established. The pressure to produce ‘single source’ produce boxes will be lifted as more growing spaces allow for diversity without the complex planting regimes and the agroecological sites the shadehouses occupy are developed with groves of fruit trees, bees and bee foraging shrubs etc as designed. Ben and I ended our discussion talking about Wesfarmers. I have family connections to this company and know the story of the Swan and Avon River Valley farming fraternity who formed a co-operative to foster farmers in 1914 – I suddenly saw that there were links between this young outfit and the company that grew to be one of Australia’s largest and most successful corporate groups. Operating with integrity and audacious courage in the early years, Wesfarmers has helped to enrich 3, soon to be 4, even 5 generations, of WA folk. Wesfarmers has now switched its operations to the retail zone and its creature Coles, is not renowned for being the primary producers best friend….there is a lot of room for a young company like WOA to make the same kind of history. From the wheatbelt to the foodbelt, I’m in.